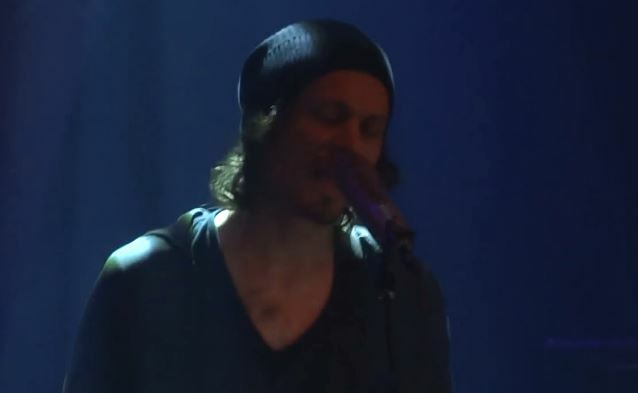 RAMBO RIMBAUD, the solo project of HIM mainman Ville Valo, performed on the first night of the Helldone festival on December 29, 2014 at Tavastia in Helsinki, Finland. Fan-filmed video footage of the concert can be seen below. RAMBO RIMBAUD's official description, courtesy of Helldone: "This mysterious act from 'somewhere behind God's back' has until now kept the lowest of low profiles. The few who managed to catch a glimpse of RAMBO RIMBAUD's live appearances under various monikers in the mid noughties confess in unison that they had been blown away. 'It's hard to put a finger on the music, other than it being out of this world, emotional and very powerful. I actually remember wondering where they have disappeared!' After these humble beginnings, a series of unfortunate events brought about a forced hiatus of almost ten years, but now RAMBO RIMBAUD is finally working on its debut album, tentatively entitled 'Militantly Violent Libertine'." HIM released a limited-edition box set, "Lashes To Ashes, Lust To Dust: A Vinyl Retrospective '96-'03", on December 23 via The End. The box set includes the rare debut 1996 EP"666 Ways To Love: Prologue" on 180-gram heavyweight vinyl for the first time ever, along with an exclusive Heartagram logo slipmat and a USB drive with 37 bonus tracks, 80 tracks all together, all remastered. Also being released are four of HIM's iconic albums, "Greatest Love Songs Vol. 666", "Razorblade Romance", "Deep Shadows And Brilliant Highlights" and "Love Metal", in multiple configurations, all remastered with bonus tracks, exclusive liner notes, and special packaging.